Feel free to download one of our drawings of our products. 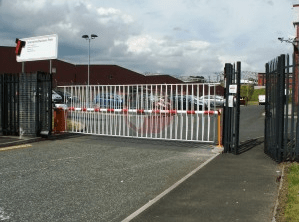 On this page you can find dimension drawings of Automatic Barriers (with a variety of different layouts), Turnstiles, Sliding Gates and Cantilever Gates, available in PDF format. Also on this page, you can find data sheets for both our Radar Speed Signs and our Automatic Bollards. If you would like the file in .dwg (AutoCad format) then email us at sales@automatesystems.co.uk or give us a call on 0800 169 8688. Our drawings are perfect for architects or otherwise looking to help plan a site. The RIB “Rapid N” is a barrier designed to secure a space of up to 6m (5m with a bottom skirt). 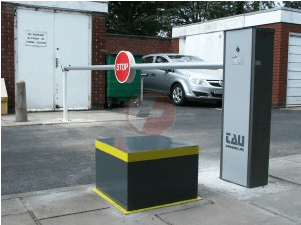 Capable of performing 1500 operations a day and compatible with a wide range of access control solutions, the Rapid N is perfect for securing smaller entrances into areas such as car parks. (IP54 Rated). The RIB “Normal” Barrier is designed to secure a space up to 7m long, (6m with a bottom skirt). 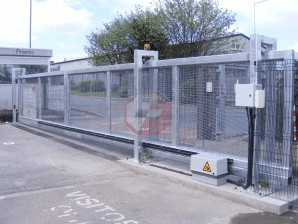 The “Normal” Barrier is designed for larger, industrial entrances and can be fitted with a full, high security skirt. The barrier is capable of up to 1000 operations a day and is highly durable (IP55 protection grade). The TAU “RBLO” Barrier, is a smaller unit, suitable for securing spaces up to 4m. With an opening time of just 1.9 seconds, and it’s sleek grey design, the TAU is perfect for someone looking for quick, easy and secure access when space is an issue. Automate Systems Ltd also provides a range of cantilever sliding gates, that are again, custom built to order. 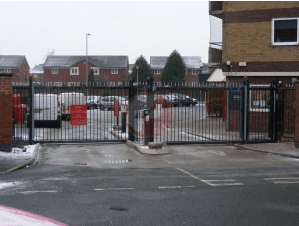 We can build and install a cantilever gate of up to 7.5 metres. For more information about the types of foundation needed, as well as runback space required, please click on the link below. Automate Systems Ltd offers both full height, and half height turnstiles to suit any needs. 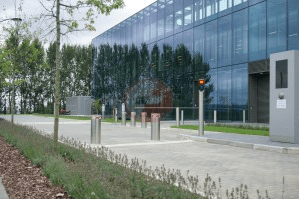 The turnstiles can linked with a wide variety of access control systems and can also be installed with both pedestrian or a DDA Compliant glass swing gate. For a drawing of one of our full height turnstiles please click below. 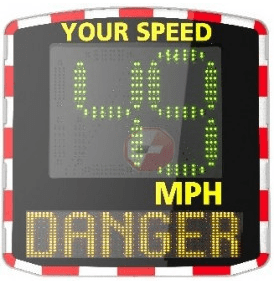 Our range of Radar Speed Signs, with built in radar speed detector and a highly programmable digital display, provide the perfect solution for any site wishing to alert vehicles of both their current speed, and the site speed limit. 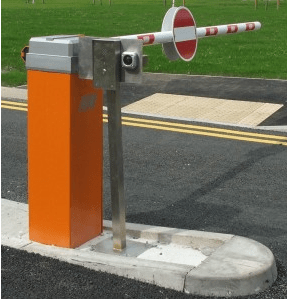 Automate Systems Ltd provides a variety of different automatic bollards to various different standards. For information on the “Stoppy”, a standard automatic bollard, please click on the link below. If you would like more information on the higher rated, anti-terror bollards, please contact us on 0800 169 8688. For more information on the types of solutions we can provide, please click here. 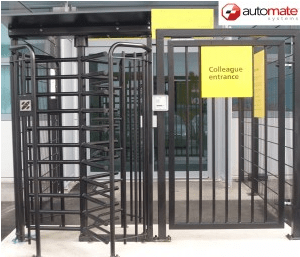 A free site survey to assess your turnstile requirements by one of our experienced engineers, who have vast knowledge of solving security turnstile problems and are able to relate this product to your needs. The engineer may feel a more suitable and cost effective product would better suit your project, and would discuss the options available with you. 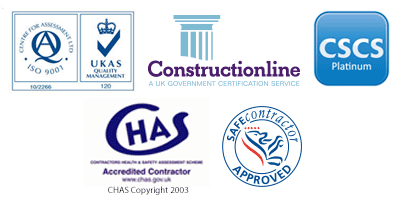 We can also advise you on civils/groundworks, provide drawings, and talk through the installation process with you. We can supply drawings and diagrams along with all the technical information and cabling details for the Turnstile you choose. We can discuss the methods of operation for security turnstiles and provide a specification of the products required to help with your tender or design. For information on the types of access control solutions we can provide, please click here.